Eliza Gilkyson is an Austin, Texas-based folk musician. She is the daughter of songwriter and folk musician Terry Gilkyson and Jane Gilkyson. She is the sister of guitarist Tony Gilkyson, who played with the Los Angeles-based bands Lone Justice and X.
Gilkyson earned her first Grammy Award nomination at age 55, as a grandmother. The nomination recognized a remarkable burst of creative songwriting from Gilkyson that began around the time her father died in 1999, some of it personal in nature and some of it immersed in the political issues of the day. For Gilkyson, it was clear that her new renown had come from self-knowledge. "In a way, it's almost better that [success] didn't happen for me years ago, because I didn't know who I was," she mused to Brad Buchholz of the Austin American-Statesman. "And because I didn't become a 'star,' I became more and more committed to finding out who the hell I am and what this journey is for me." Gilkyson grew up in the midst of the Hollywood entertainment industry. Her father, Terry Gilkyson, was a songwriter who treated the profession as a nine-to-five job. Among the hits notched by Terry Gilkyson were Frankie Laine's "Cry of the Wild Goose," Dean Martin's "Memories Are Made of This," the 1960 folk-pop smash "Greenfields," recorded by the Brothers Four, and "The Bare Necessities," from the 1967 Disney Studios film The Jungle Book. Gilkyson's sister, Nancy, and brother, Tony, both went into the music industry; Tony became a guitarist with the Los Angeles punk band X. Gilkyson grew up with folk singers and gospel groups as part of her home environment, and by the time she was in her early teens she was singing on her father's demo recordings. In the late 1960s, though, Gilkyson was devastated by her mother's death in an automobile crash. She moved to rural New Mexico, married and had a son, Cisco Gilliland, who later took her last name and became a percussionist in her band. The family lived a life influenced by the hippie communes of the time. "My feelings of expectation--whether you want to call them naïve or innocent--were connected to the 'Big Dream' of our generation," she explained to Buchholz. "We had an incredible sense of expectation about relationships, sure--but also about the future of society and the world." Ambitious despite her low-cost lifestyle, Gilkyson wrote songs prolifically. Her first album, Eliza '69, was released in 1969 on the small Mont Clare label, and while it took her ten years to return again to the recording studio, she performed frequently in New Mexico clubs and wrote idealistic songs like "Lights of Santa Fe," which addressed the plight of Native Americans. She released her second album, Love from the Heart, under the name Lisa Gilkyson in 1979. After that, aiming for bigger things and finding the Santa Fe scene too isolated, she headed for Austin, Texas, in the early 1980s. She married again and had a daughter, Cordelia Castillo. Singer-songwriters were at a low ebb in the music industry in the 1980s, and Gilkyson began to experiment with electric rock and country sounds. She signed with the high-powered booking agency Free Flow Productions. Tall and good-looking, she began to make an impression on Austin audiences with songs that often included themes of social criticism. Rosanne Cash recorded Gilkyson's impassioned anthem of escape from domestic violence, "Rosie Strike Back," on her 1987 King's Record Shop LP. For a time Gilkyson seemed to be on the edge of stardom. "The pop thing was like tiramisu. I just couldn't resist," she recalled to Buchholz. "I was still young enough to be swayed by the illusion that I was a 'viable product.'" But Gilkyson's inner uncertainty showed in her scattershot approach to promoting herself. She bounced around Texas, New Mexico, and California, and in the late 1980s she released two heavily produced albums, Pilgrims and Legend of the Rainbow Warrior, that were classified by the recording industry as New Age. Gilkyson herself didn't accept that label, but it proved a temporary pigeonhole, and for a while she went along with the opportunities it offered. Her second marriage dissolved, and she lived in Europe for several years in the early 1990s, touring with Swiss New Age harpist Andreas Vollenweider. She returned to the United States in 1994 and released the album Through the Looking Glass on the Private Music label. Redemption Road followed in 1997 on Silver Wave. These albums made little commercial impact, but Gilkyson by this time was focusing on singer-songwriter material, honing her craft, and beginning to explore personal themes. Terry Gilkyson's death brought things to a head creatively for his daughter. She had long harbored ambivalent feelings toward him due to his abuse of alcohol, but now she realized the depth of his contributions to her own creativity. She told Buchholz, "Around the time my father died, I began to see how my grieving--in relationship and career and everything--was deeper than any specific incident. ... But if you can live with loss and recognize it as part of the human experience, then you can give yourself permission to love. ... You learn in the end that loving and loss are joined at the hip." Gilkyson spent her own money to form her own label, Realiza, and issue a collection of songs called Misfits. It began to find airplay on folk music radio shows, and Gilkyson was signed to Minnesota's Red House label, one of the leading companies in the folk field. The profile of the 50-year-old Gilkyson rose sharply after the 2000 release of her album Hard Times in Babylon, a mature work that distilled her complex lifetime of experiences into a dozen expertly rendered story songs about love and loss. National print and radio outlets began to follow Gilkyson's career, and People termed her "a neo-folkie find" after the release in 2002 of Lost and Found, commenting that Gilkyson's "honest voice and understated, life-affirming lyrics remain the core of her songs." Gilkyson's 2004 album The Land of Milk and Honey took a sharp turn toward the political. Songs on the album attacked U.S. involvement in Iraq and the administration of President George W. Bush, and vocalists Mary Chapin Carpenter, Patty Griffin, and Iris DeMent joined Gilkyson at the album's end for a rendition of a little-known song by legendary activist folk troubador Woody Guthrie, titled "Peace Call." Gilkyson won a Grammy nomination for Best Contemporary Folk Allbum for The Land of Milk and Honey, losing to Steve Earle's The Revolution Starts ... Now. Gilkyson didn't slow down, issuing a collection of unreleased material called RetroSpecto on her own label in 2005 and following that up with Paradise Hotel. The folk magazine Sing Out! declared in a review of the album, "It's almost scary how good her writing and performances have gotten." The magazine quoted folk DJ Randy Wynne as saying that Gilkyson was experiencing a "mid-life creative explosion." It remained to be seen just how far the sound of that explosion would reach. In 2008, her album Beautiful World came out, again on Red House Records. The songs vary from pop to folk and points in-between, with songs ranging from intimate ballads to rallying cries against the imperialist machine. She recently collaborated on a new album entitled Red Horse with two of her Red House Records label-mates John Gorka and Lucy Kaplansky. In 2011, she came out with Roses at the End of Time. Recorded at her home with the help of her son and co-producer Cisco Ryder Eliza took a longer time in the studio and came out with a more eclectic and personal album. She continues to tour about 150 dates per year in the United States and overseas. -Eliza '69 Mont Clare, 1969. -Love from the Heart Helios, 1979. -Legends of Rainmaker Gold Castle, 1988. -Through the Looking Glass Private Music, 1994. -Redemption Road Silver Wave, 1997. -Hard Times in Babylon Red House, 2000. -Lost and Found Red House, 2002. -The Land of Milk and Honey Red House, 2004. -Paradise Hotel Red House, 2005. 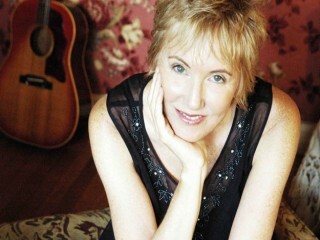 View the full website biography of Eliza Gilkyson.